Constructed of 900D polyester fabric with a lightweight heat treated aluminum frame makes this blind light but durable. 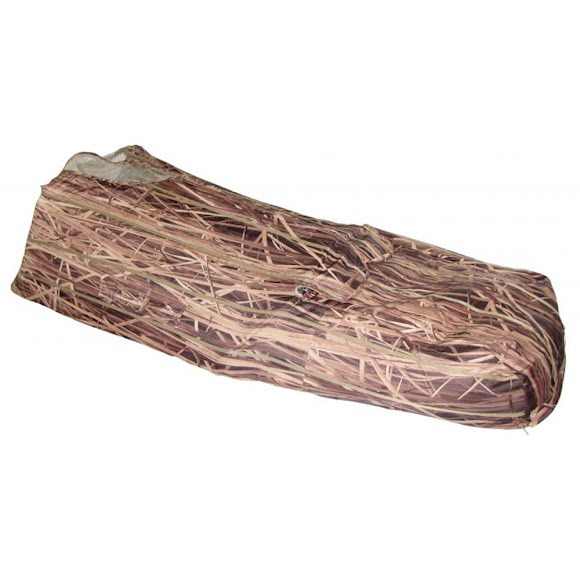 Heavy fabric helps to keep out the chill and dampness found in those late season hunts. Padded backrest/seat with inside door goose flag storage pouch. Two large inside storage mesh pouches for shells, drinks, etc. Constructed of 900D polyester fabric with a lightweight heat treated aluminum frame makes this blind light but durable. Heavy fabric helps to keep out the chill and dampness found in those late season hunts. Padded backrest/seat with inside door goose flag storage pouch. Two large inside storage mesh pouches for shells, drinks, etc. Zip open bottom for easy cleaning and a backrest handle that allows you to easily drag the blind rather than carry when the wind switches and you need to change your set up. Adjustable shoulder carry strap. Measurements 84" x 36" x 18", Collapsed: 54" x 36" x 4"